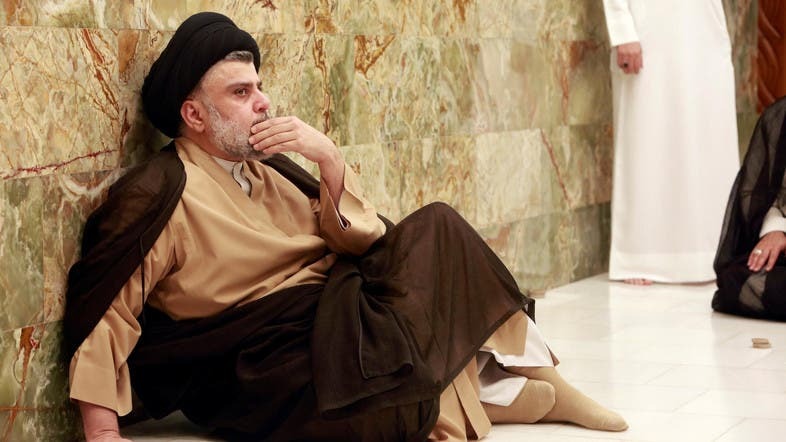 Shiite cleric Muqtada al-Sadr and his cross sectarian Sairoon coalition (On the move), who are set to win Iraq’s elections after preliminary results showed they were in the lead, seek to form a technocratic cabinet. Meanwhile, some media reports said the Iranian embassy is interfering in the cabinet formation process by attempting to bring some political blocs together. Sadr announced the shape of his next alliances to form a cabinet via Twitter. He excluded any alliance with Al-Fatah Alliance which is affiliated with the Popular Mobilization Militia, with the Alliance of the State of the Law that is headed by former Prime Minister Nouri al-Maliki and with the Patriotic Union of Kurdistan that is affiliated with late president Jalal Talabani. “We are ‘on the move’ in ‘wisdom’ and ‘nationalism,’ to meet our people’s ‘will,’ build a ‘new generation’ and witness ‘change’ towards reform so the ‘decision’ is Iraqi and we can raise the ‘banners’ of ‘victory,’ so ‘Baghdad,’ the capital, is our ‘identity’ and ‘our democratic efforts’ are (directed) towards forming a parental government that consists of technocrat ‘cadres’,” Sadr said on Twitter. His tweet voiced his intent to ally with the National Wisdom Movement led by Ammar al-Hakim, the National Coalition headed by Ayad Allawi and the Eradaa (Will) Movement led by Hanan al-Fatlawi. It also voiced his intent to ally with the New Generation political platform led by young Kurdish businessman Shaswar Abdulwahid, the Kurdish Change bloc (Gorran) and the Decision Bloc led by former parliament speaker Osama al-Nujaifi. He also intends to include Bayariq al-Kheir (the banners of benevolence) bloc led by former defense minister Khaled al-Obeidi, the Victory Alliance led by Prime Minister Haidar al-Abadi, the Baghdad Coalition led by Mahmoud al-Mashhadani, the Kurdistan Democratic Party led by Masoud Barzani and the Competencies bloc led by Haitham al-Jubouri. Saudi minister of state for Arab Gulf affairs Thamer Al Sabhan, the kingdom’s former ambassador to Iraq, congratulated Iraq for holding the elections and commented on Sadr’s tweet. “You are truly on the move in wisdom, patriotism and solidarity. You’ve made the decision for change towards an Iraq that raises the banners of victory with its independence, Arabism and identity. I congratulate Iraq for having you,” Sabhan said via Twitter. Meanwhile, local media outlets quoted a political source as saying that four lists intend to form an alliance on Tuesday to form the biggest bloc in parliament. It will include the State of Law Coalition, the Fatah Alliance and the Patriotic Union of Kurdistan. The fourth list has not yet been announced. A source close to the Iranian embassy in Baghdad had told Al-Arabiya.net that five days before the elections were held, a meeting was held between Maliki, Hadi Al-Amiri, Allawi, Salim al-Jabouri and the Iranian ambassador in Iraq to discuss forming a big bloc to announce forming the cabinet of political majority and which will be cross sectarian.